The following is a Presentation I made to a ‘Roundtable’ discussion with TEAR Australia, in August 2009, discussing the needs and possibilities for supporting government and non-government personnel working in Aboriginal communities across Australia to improve community development outcomes for Indigenous people. 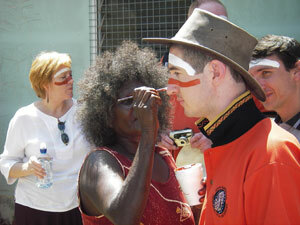 Community Justice personnel being prepared for an insight into Yolngu culture. What I am presenting to you in the following is based on my perspective after 8 years of experience working with the Yolngu people of North East Arnhem Land, working in health and business education, using their local language and cultural concepts, through Why Warriors Pty Ltd. This is backed up by more than 35 years of historical knowledge from the region through my family, and work with Aboriginal Resource Development Services (ARDS). In this short presentation I use generalisations based on our experience with the Yolngu people of North East (NE) Arnhem Land, though we are confident from communication with Indigenous people elsewhere, that these factors apply to remote Indigenous communities across northern and central Australia. I focus on the needs of remote communities but believe that these points could also be applied, in slightly different ways, to regional and urban Australia. It is important to always work from the root cause to find solutions. We need to work from an underlying theory about the problems facing Indigenous communities in order to bring consistency to our methods and so we can test and review where our theory or method fails us in practice. A reflection in theory about root causes is standard for good Community Development practice. Our view is that the primary underlining cause of virtually all issues facing Indigenous people in remote communities today (with historical influences in regional and urban areas) is a lack of effective communication between the Indigenous peoples and the Dominant Culture due to racial, cross-cultural and cross-language dynamics. The colonial invasion has created a new world around remote Indigenous people, but as a result they are marginalised from access to the information, and the knowledge they need to succeed in this new world of the Dominant Culture in Australia. The people are unable to obtain the necessary information because it is not made available to them in a form they can understand or interpret. Because of differences in language, symbology and world view, Indigenous cultural groups are unable to explore and test new knowledge from the Dominant Culture so that it can become part of their cultural knowledge base. For example; Where did you learn the basics of how to manage money loans, credit and debt? For most Dominant Culture people, it was through your parents, and later your peers. We usually adopt basic knowledge and behaviours regarding our use of finances through the teachings and demonstrations of our parents. The result is that today for those that are part of Australia’s mainstream culture, virtually without thinking you have a method for saving money, you know the importance of keeping the appropriate documents, you have an idea of how quickly interest can accumulate over time, and you are convinced of the need for regular payments to off-set interest on a loan. You know all this subconsciously. It is part of your cultural knowledge base, you do not have to relearn it regularly. When does a Yolngu person learn these things? They only really learn these things when they get a loan, or if they try to start a business, and they have to learn these things from scratch, and then consciously remember and, essentially, relearn these concepts daily to manage their monies in the mainstream system. Let us consider this another way. You, as a person who has learnt the Dominant Culture, know subconsciously that there is a strong legal distinction between personal and business monies. This is because for the Dominant Culture corporate entities function separately from the family. 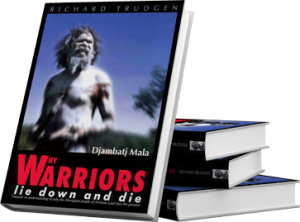 What you don’t know is that for Yolngu, the corporate entity of trade in their culture is the clan. Rather than being a legal body separated from private life, clan corporate responsibilities include management of clan member’s birth, death, survival, and education, as well as trade and governance. Because of the Dominant Cultures ignorance about this, the mainstream system gives little allowance for business monies to be used in clan affairs, and this is just one reason why Yolngu entrepreneurs often bury themselves in debt. As you can see there are massive knowledge gaps, on both sides (Indigenous and mainstream) but the ignorance that results has its greatest effect on Indigenous people and their communities because the Dominant Culture has control. Consequently, remote Indigenous people must struggle to stay healthy in a new western lifestyle, grapple with a foreign trade systems, and struggle to simply manage their life in a world controlled by the Dominant Culture. There are numerous examples; words such as, germs, and infection, or contract, and liability have no meaning, or completely the wrong meaning to many remote Indigenous people. These particular examples are words that embody concepts that must be understood in order to take medicines correctly and live hygienically in modern housing, or in regard to the latter these concepts are needed to manage finances and make business deals. Due to knowledge gaps remote Indigenous people live with uncertainty in dealing with the world the Dominant Culture has created around them. Lack of underlying knowledge results in a lack of control over their world. Many symptoms of community dysfunction flow from this. For example, when a Yolngu man attempts to better his world, it often becomes a stressful encounter, and therefore he may become susceptible to drug and alcohol abuse in an attempt to escape a world he cannot seem to master, due to a lack of knowledge he doesn’t even know he is missing. There are huge gaps in peoples capacity to understand mainstream systems, diseases and laws… etc. This is not because of any difference in ability or intelligence but simply because it is not made available in an appropriate form. Consequently the ability of the Dominant Culture to communicate information or “educate” effectively is pivotal for community transformation. Thus the foundation to successful Community Development with Indigenous peoples lies in the quality of the Dominant Culture personnel who are placed in remote communities or in Indigenous affairs in general. 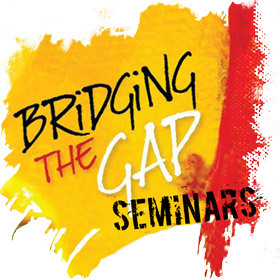 Dominant Culture Personnel are required to stand in the gap; the information, communication and education gap, in order to facilitate Indigenous people’s interaction with, and their learning about, the new world they face. To do this effectively these personnel need to be: 1. A certain quality of person. They need to have the right attitude and regard for humanity. This is the most important starting point for good communication and cross-cultural effectiveness. 2. Trained to know how to deal with the complex social, racial, linguistic and cultural environment they enter when serving Indigenous people. 3. Supported to stay in the community longer, to facilitate knowledge exchange between the cultures, and create continuity and stability. While I am emphasising the importance of workers who come from the Dominant Culture, I must clarify that success in community development is always the result of the intellect, abilities, skills and persistence of the local people themselves. (I stress this does not mean the success of importing successful Indigenous individuals from elsewhere). Community development is only sustainable, and therefore only successful, when the potential, ideas and raw power (sweat) of the local people is unleashed. This cannot be contrived through any form of manipulation or coercion. Dominant culture personnel can facilitate this by working in cooperation, dialogue, and “solidarity” (as Paulo Friere would say) with the people. This requires personnel with a particular attitude and ideology. Dominant culture personnel must have an attitude of love toward the people and their potential over and above a desire to solve the social problems, or institute outsider ideas and values. Humility is also important, perceiving others as equals and not to think of yourself as the saviour of the poor Indigenous person. An attitude of superiority makes it impossible to act in a way that builds relationships and empowers others. The people will always recognise the hypocrisy in the actions of a person who attempts to empower but believes themselves superior. Personnel can be taught right attitudes to a degree, and personnel training must include a process of attitude formation. However, selfishly motivated people, or those with entrenched racial superiority complexes cannot succeed in community development. It is far easier to recruit people who are already able to view Indigenous people (and their culture and society) as their equals, then to change people with poor attitudes – for really only God can do that. Personnel should be recruited with the right attitudes. I suggest that strategies to help quality people discover their call to work with Indigenous communities and then enable them to take positions in communities, is possibly the first step to enabling positive change in Indigenous communities. Presently Dominant Culture Personnel are starting work with Indigenous communities with little preparatory training. This is unusual in the global work place. Army officers going overseas get extensive briefing and training to cope with the new cultural and political situations they will be encountering. This is even more the case with personnel in Christian Mission, and Charity organisations; they spend months or years preparing in language, cross-cultural and development skills. Is it because Indigenous people live inside Australia that we do not take into account the language and cultural difficulties personnel will encounter? This is changing and most government organisations require basic cultural awareness training, but often this training is poorly founded in practice and consists of short and once off workshops. The training required for Dominant Culture Personnel as I have suggested, needs to cover; cross-cultural communication skills, the complex racial/cultural dynamics, along with ideological and methodological studies for community development. And lets not forget that in many remote communities, studies in the local Indigenous Language is essential if real knowledge exchange is to occur, and the communities potential to be unleashed. Importantly, especially if we can encourage personnel who already have good attitudes, training need not be a huge bachelor degree or something of that sort, but more importantly it needs to be extensive ongoing training (eg regularly at 3 months, 6 months, 12months, 2 years). Community development is a practice of engaging with the community and then reflecting on how to do it better. Regular ongoing training helps this process. Ongoing training with personnel helps re-enforce what they have learnt. What we see from the 2 day courses we currently run is that personnel learn a lot but only retain a small amount. Once in the field they fall back into dominant culture assumptions under the pressures and stresses of their job. Returning to training at intervals gives them a break, refreshes their understanding and allows them to discover new things that can be applied directly and specifically to their job with the people. Without quality recruitment, training and ongoing support, Dominant Culture personnel actually make the situation worse for Indigenous people, like the Yolngu people. This is mostly the situation today. Most Dominant Culture personnel who come to work on Indigenous communities today, are short term contractors or stay at most 1-3 years. Others fly in and out and reside in major centres, and thus have even less real availability to the Indigenous community and less real experience of local needs. The result is effectively development tourism. This creates instability for the local people , who are constantly attempting to manage new personnel. Furthermore, the temporary nature of personnel in Indigenous communities also prevents that passing on of corporate knowledge about effective development practice. Dominant Culture personnel in communities today have little knowledge of what has or has not worked over the years, because of the constant replacement of personnel. The result is agencies continually repeat programs and policies that come out of “western” assumptions about how to fix the ‘problems’. Organisations continue to reintroduce the same old failures like feeding programs for children, an idea which perpetuates welfare dependencies in parents and children, and reduces parents sense of worth in their child’s life. Or forced English only education which was tried 3 years ago and dumped only to be taken up again more forcefully by the current NT labour government. The policy will lead to lower retention at grade 4-5 and poor literacy outcomes in high school students, not to mention the undermining of traditional knowledge. Our own corporate history over 35 years allows us to critic these ideas as rehashes, but this history also suggests that what works is trained personnel who stay on in community long term. We see evidence of this from the mid 1960s to the late 1970s in NE Arnhem Land where the Methodist missionaries required all their personnel to undertake language training and also later community development training. Although they also got many things wrong, these personnel helped create a situation where 90% of jobs in the community were being filled by local Yolngu. This is completely unlike the present conditions, where most jobs are filled by outsiders. Personnel who stay on communities longer, acquire more effective skills in working with and relating to Indigenous people and they facilitate the exchange of useful information across the cultural gap by developing better relationships of trust with Indigenous people over time. I believe there is a link between support, training, the quality and attitudes of personnel and the time personnel choose to stay on working with Indigenous people . The Methodist church had many people who stayed long term in community (>10 years). This was due to their love for the people but also I think because their training requirements meant they were skilled and equipped. (We also see long term personnel in other organisations today who practice either quality recruitment or train effectively eg. ARDS and ALPA) Personnel who can’t communicate well with Indigenous people and are unprepared for things like culture shock and horizontal violence, consequently suffer similar confusion and stress to what Yolngu feel in dealing with the unknown of the Dominant Culture. And so personnel stress out and leave. (At far as I am aware teachers can still receive up to 6 months paid stress leave after a stint in remote communities, but limited if any training is provided prior to arrival ). The Methodist missionaries also worked together with a common goal and could draw on each other and the larger church structures for support. Personnel when placed on community need support. People who have to rely on their own energy constantly to cope with stress cannot use that energy to empower others. They need to know who to go to when things get tough for help and advice. They need to be part of a larger team working for common ends – their success at serving Indigenous communities. They need follow up training and they need regular counselling support. In summary, considering the information marginalisation of Indigenous peoples, community development in Indigenous communities requires as the first foundation, Dominant Culture personnel to stand in the information and communication gap. This is necessary not because Dominant Culture personnel make development happen, but to facilitate grass roots transformation by the local Indigenous people, through the abilities, sweat, intelligence and knowledge of the local people. In order to walk along side Indigenous people without usurping them Dominant Culture personnel must be recruited with appropriate attitudes. To build on this, personnel also require ongoing training to enable them to communicate and educate effectively, and to build strong relationships in the communities. Finally personnel require ongoing support to help them remain long term for stability and continuity of corporate knowledge. I do believe that dedicated community development workers are required in communities, but it is also critical that those in government and non-government service roles are recruited, trained and supported appropriately to support true grass roots development,and to ensure local Indigenous people are empowered. In this way we could see a ground force of servants to community empowerment, standing in the information gap, and working together. That these basic foundations of recruiting, training and supporting personnel do not already exist is damaging, but implementing them is also the greatest opportunity for change in remote Indigenous communities. See how Why Warriors works in this area with Arnhem Human Enterprise Development. When explaining to people that there is a communication problem – very often dominant culture people jump to the conclusion that English must be forced onto Aboriginal people as their first language. Do you have any articles that explain to them the importance of local language? There are two articles on the cultural worlds blog, that might help, but they focused on the the problems ignoring the mother tongues in education. Be sure if anyone has time to take a look and freely add any aboriginal, cultural, heritage information you have about your areas. Hi Tim,Thanks for this excellent summary of good CD principles.These principles and way of working are known to work in other communities in Australia (eg public housing estates in SW Sydney) and O.S. (eg work done through aid agencies and also with marginalised people in the UK and elsewhere). It is a shame that those working with Indigenous communities have not embraced this way of working to date. Best wishes to you and Kama. You really made your information and requirements very clear. I hope you get all of the support this project deserves. Thanks mate, reading this stuff is really helpful. I’m sure TEAR appreciated your insights.